This month’s meeting packed the Pi meeting room and it was a fine example of member helping members. 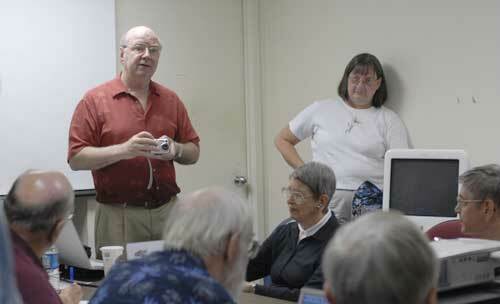 Nineteen Pi members watched and listened to Steve Lemon’s demonstration of how he created a Photo Family Story on a DVD. He began, “It started with one sleepless night,” when browsing online led to finding a five minute movie done in honor of a woman’s life. The show began with black and white photographs from early in the last century, when she was born. Watching a person grow from infancy to old age in a few minutes is quite moving. It inspired Steve to think about doing that for his family, and then being moved to act so that he made a family photo record, with music and story. Ultimately he distributed forty copies of the end product to interested relatives! The concept is simple: collect old photos and new, select music, panning, and voice-over narration: the result becomes quite moving. Steve told how he began with only a crude notion about how he could develop a family history on a DVD. He wrote a proposal to his sisters and brothers, asking them for old photos to use in composing this history of their parents, themselves, and their children. He received eight thousand photos! This number of pictures forced him to develop a process for how he was going to move ahead. He told the Retired group how the ensuing work evolved over more than a year. He gave out an outline of the steps to create the photo DVD and showed examples of his work. He credited Apple’s Web site, www.apple.com, with a useful tutorial. Prompted by his wife’s suggestion to offer himself as a consultant, he is now in the business to help others produce this type of multi-media product. Our group responded with fascination at his concept. We were grateful to see and hear what Steve has done using iMusic, iPhoto, and Keynote. He provided an orderly approach for group members to replicate his method and their content, or call him for assistance. For the October 26, 2006 meeting, the topic will be Keynote. For homework, take a look at Pat Fouquet’s blog on http://web.mac.com/patf. See everyone there.